Bolton council, Greater Manchester; caused by the resignation of Labour councillor Asif Ibrahim due to pressure of work. He had served since 2012. Between Manchester and Bolton, the ugliness is so complete that is almost exhilarating. It challenges you to live there. Challenge accepted. That was J B Priestley writing in his English Journey of the early 1930s, and laying the foundation for a whole genre of “it’s grim up north” travel books which has been extensively mined ever since by a variety of authors. …yes, maybe Priestley had a point. Of course, it’s a post-industrial landscape which I’m looking over now. When Priestley was writing Nob End wasn’t the haven for rare orchids it is today: it was an active chemical waste dump overlooked by a narrowboat repair centre. Moses Gate country park, of which Nob End is a part, was filled by paper mills and a colliery. Those industries gave Farnworth a wider economic base than the average Lancashire textile town, but won’t have given it any beauty points. It says a lot for the town that Farnworth’s most famous son is Alan Ball, the youngest member of England’s World Cup-winning football team and later a long-serving football manager; Farnworth Town Hall has been restored as an office building named after Ball. Some indication of what Farnworth was like in the 1930s can be gleaned from a surprisingly comprehensive internet archive. 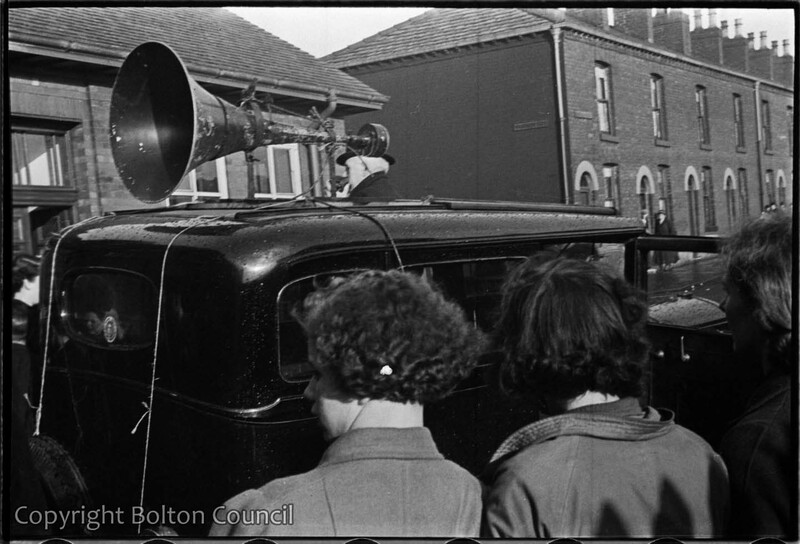 This is courtesy of Mass Observation, which covered the Farnworth parliamentary by-election of January 1938. 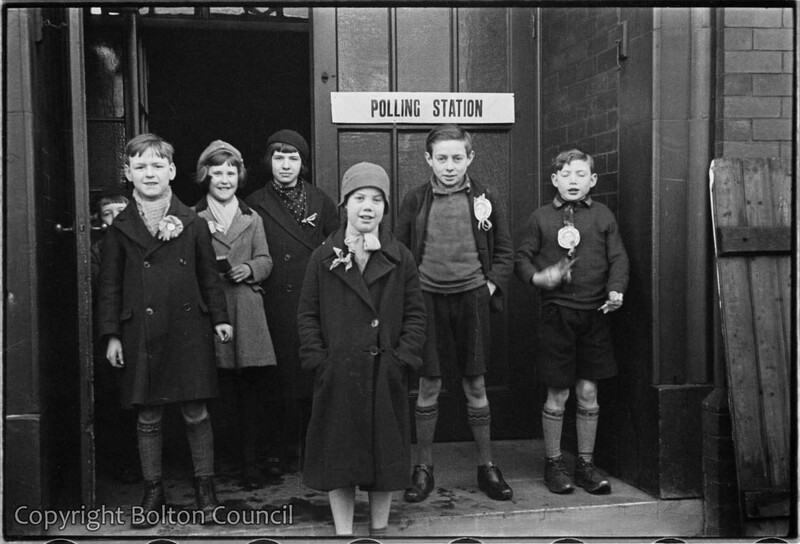 The Mass Observation archives have all been digitised and published on their own website, Bolton Worktown (http://www.boltonworktown.co.uk/), from which the above photograph of children outside a polling station is taken. Kids grew up quick in them days. Mass Observation were interested in learning how election propaganda could influence people, and newsletters from both the Conservative and Labour candidates are in their archives. 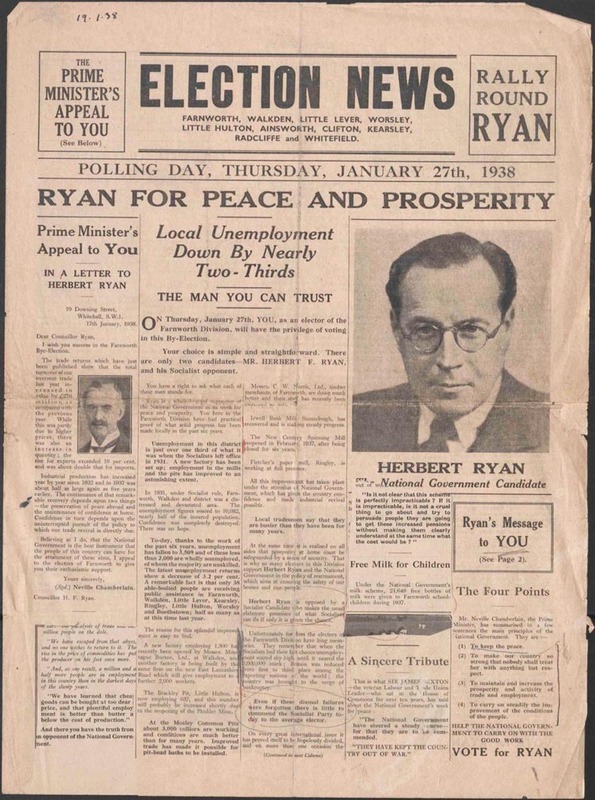 Look at the Conservative newsletter below: yes, election newspapers have been going for over eighty years now, and with some changes to the names and dates you could drop this into any letterbox in the town today and still get the message across. The polling station the 1938 kids were standing outside is a building on Bentinck Street which still stands today. You get a good view of it as you queue up to traverse one of the disaster areas of modern Farnworth, the hole at Moses Gate. Moses was, of course, a Biblical patriarch who led the Israelites out of Egypt by holding back the waters of the Red Sea. His Gate was breached in August last year by a landslip, which undermined a busy road bridge over the Manchester-Bolton railway line and broke the water main supplying your columnist’s house. The resulting hole closed the main road between Farnworth and Bolton for six months, leading to appalling travel delays, and still hasn’t been completely filled in yet. 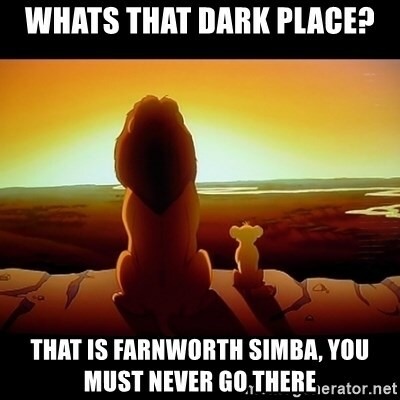 In fact, quite a lot of Farnworth is a disaster area. The town centre is one of the most sorry-looking parades of charity shops it’s possible to imagine. Its condition hasn’t noticeably been improved by £325,000 of Section 106 money paid by Tesco, who opened a large store in Farnworth in 2013. Bolton council are claiming that the money has been spent, although it’s difficult for locals to work out what is was spent on. Just one of many controversies involving Bolton council, whose Labour administration – it’s fair to say – is unpopular. In 2016, the council lost a legal case forcing it to disclose the names of two of its councillors who had been summonsed for council tax arrears. The Labour administration then got into very serious hot water by using emergency powers to pay a grant of £300,000 to a firm of personal injury lawyers. The council got the money back, but it was a close-run thing as the firm involved has since been shut down by the legal regulator. Those of you who read the preview of January’s Hulton ward by-election – a ward with a planning issue to add to all the other controversies – will not be surprised to find that Hulton is the only by-election which Labour have lost to the Conservatives so far this year. And if you read that preview you’ll have drawn the right conclusions from that gain: it’s nothing to do with Brexit, very little to do with Jeremy Corbyn, and mostly to do with just how unpopular the Bolton Labour administration is. As well as these financial and political scandals, it’s clear from the most cursory of looks around the town centre that the Greatest Town in the Known Universe is falling behind compared to its rivals in Greater Manchester. Bolton town centre might have just gained a sparkling new bus station, but clearly not many people are choosing to travel to a town centre that’s not worth visiting on buses which they can’t afford to pay the fare for. They’re voting with their feet, and the result is that Bolton is a place where charity shops – charity shops – are closing down because they can’t make ends meet. In that context it’s not surprising that while Farnworth ward is safe Labour the main opposition to them in recent years has come from that most populist of populist movements, UKIP. At the most recent Bolton election, in 2016, the Labour lead over the Kippers was 48-36. Now UKIP are in a state of general collapse at the moment – as well as their national travails, there was not one UKIP candidate in last week’s four council by-elections. (UKIP running scared of a load of snowflakes, who’d have thowt it?) So it will be interesting to see how well the Kipppers can do this time or whether some new opposition will come forward. 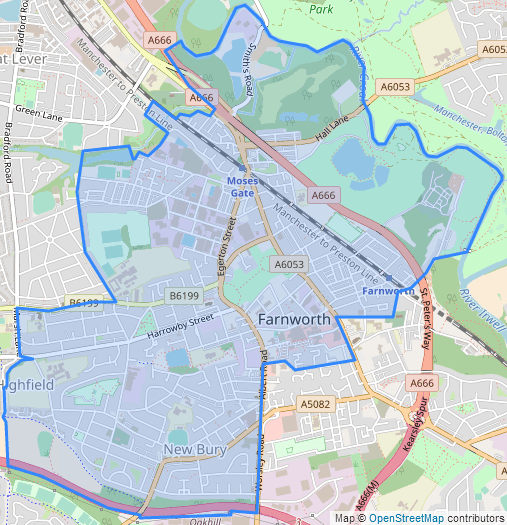 In last year’s Greater Manchester mayoral election the Conservatives ran second in Farnworth, Labour leading 68-19, and the Bolton News have been giving some prominence to a new localist party, Farnworth and Kearsley First – and it’s surprising in retrospect that nobody has previously tried to form a localist party in Bolton borough given its residents’ reputation for insularity. Tameside council, Greater Manchester; caused by the death of the Leader of the Council, Labour councillor Kieran Quinn, at the age of 57. He had suffered a heart attack while out delivering Christmas cards. Quinn had served on Tameside council since 1994, and became leader in 2010. As well as council leader, he was also chairman of the Greater Manchester Pension Fund and Tameside’s representative on the Greater Manchester Combined Authority. We make a return visit to Droylsden, a place where Andrew’s Previews has been very recently: there was a by-election in this ward last October. Droylsden is the westernmost of the agglomeration of mill towns east of Manchester which forms the Tameside district: it lies inside the M60 motorway and is very much a part of the Manchester built-up area which somehow never got annexed by the city. A classic Lancashire milltown, Droylsden claims to be the birthplace of the terry towel, which was first machine-woven by W M Christy and Sons in 1851. Robertson’s jam factory, next to the Ashton Canal, was also a major employer. All this is gone now – the site of Christy’s factory is now occupied by a Tesco off Ashton New Road. That Tesco and the proximity to the big city has clearly badly affected Droylsden’s shopping centre, which when your columnist visited a few years ago was a parade of charity shops as bad as anything in Farnworth. The Metrolink came here in 2013, running along Ashton New Road to link the town to Manchester city centre and outwards to Ashton-under-Lyne. Droylsden tram stop is within Droylsden East ward, which covers the Fairfield area south of Ashton New Road and also extends north along Market Street and Lumb Lane. In general, the further away you get from Ashton New Road, the less deprived the neighbourhood becomes. 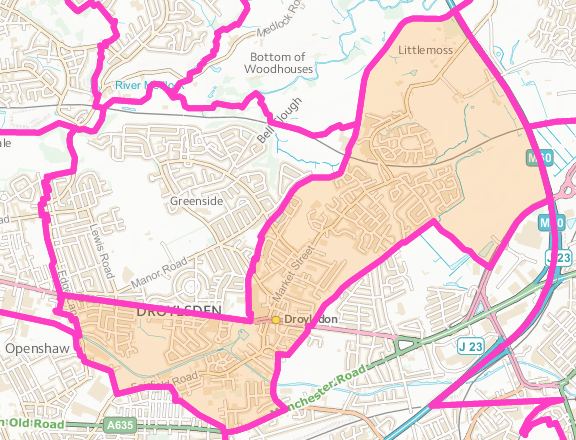 There was briefly a Droylsden parliamentary constituency, created in the 1950 redistribution and abolished in 1955, and if the Boundary Commission get their way something similar could be created for the 2022 election. 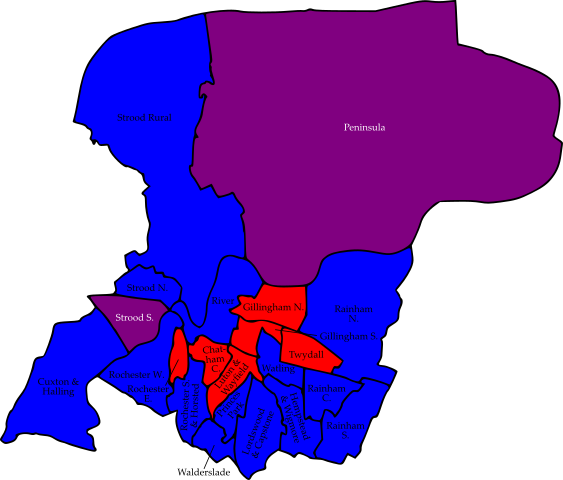 The Droylsden constituency was marginal between Labour and the Conservatives in the 1950 and 1951 elections, but the Conservative vote in Tameside has basically fallen apart over the post-war period – the Tories have only one reliable ward in the borough, Stalybridge South – and it’s the radical right who have generally filled the runner-up spot in Droylsden East over the last decade. The BNP ran second here from 2006 to 2010, and UKIP were runners-up from 2011 to 2016. The Kippers got within 10 points of Labour in 2014 but by 2016 the Labour lead had improved to 56-34. In the 2017 Greater Manchester mayoral election Andy Burnham led the Conservative candidate here 67-19. The Tories did better in October’s by-election in which there was no UKIP candidate: Labour beat them 60-33 on that occasion. Defending Droylsden East’s second by-election in six months is Laura Boyle, a primary school teacher. Also working in the education sector is IT professional and Conservative candidate Matt Stevenson, who returns after his second place in last October’s by-election. Shaun Offerman of the Lib Dems and Annie Train of the Green Party complete the ballot paper. Nottingham council; caused by the death of Conservative councillor Georgina Culley at the age of 65. The leader of Nottingham’s Conservative group, Culley was first elected in 1991, representing Wollaton ward until 2003 and Wollaton West since then. We enter the Midlands and travel to the city of Nottingham for an area which is very different in character to Farnworth or Droylsden. 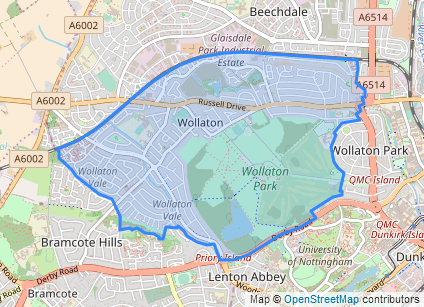 Wollaton West ward lies in the west of the city, with around half its acreage being taken up by Wollaton Park and the ward’s housing lying to the north and west of the park. This is one of the most desirable places to live in Nottingham, with the city’s highest proportion of people in the “higher management” employment bracket and competition for places at the local schools being fierce. One rather unexpected local resident is Batman: Wollaton Hall, former home of the Willoughby family in the middle of Wollaton Park, was used as the exterior of Wayne Manor in the 2012 Batman film, ?The Dark Knight Rises. An appropriate location: the real-life Gotham village is not far away, and by a strange coincidence the surnames of the actors who played Batman and Robin in the famously camp 1960s TV series combine to give “West Ward”. Not that I’m suggesting that all the local residents of this particular West ward are as rich as Bruce Wayne, but this is the strongest Conservative ward in Nottingham and the party traditionally had a lock on the ward’s three seats. That, however, changed in 2013 when one of the Conservative councillors died – having suffered a stroke while out campaigning in a by-election for a neighbouring ward – and a by-election was forced. In retrospect the Conservatives made a poor choice of candidate, pitting a 22-year-old working in media and living in the city centre against a Labour candidate with firm roots in the local community. That Labour candidate, Steve Battlemuch, won the by-election by the score of 47-34, a swing of 14% since the 2011 election and a staggering 20% swing compared with 2007. The 2015 election represented no change to the party split of two Conservatives and one Labour. Battlemuch topped the poll with an enormous personal vote – he was over a thousand votes ahead of his running-mates – and overall the Labour lead over the Conservatives was 42-39. 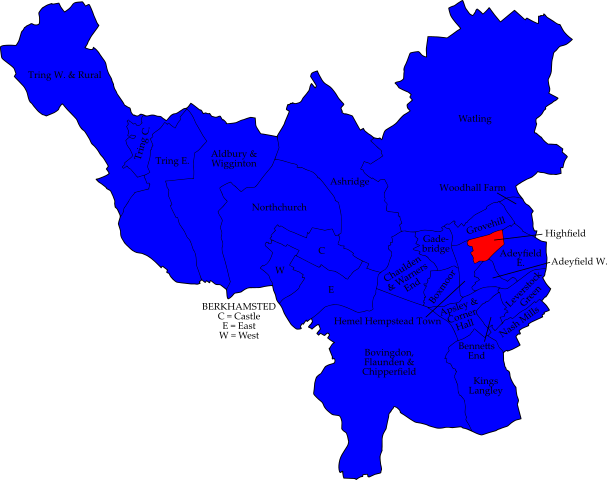 The two Conservatives elected from this ward in 2015 form two-thirds of the Tory opposition on Nottingham city council. So, who do Batman and the other electors have to choose from this time round for this marginal ward? The defending Conservative candidate is local resident Paul Brittain. Labour have selected Cate Woodward, who works for a Parkinson’s disease charity. Tony Sutton stands for the Lib Dems and Adam McGregor for the Greens. We have to have a DC Comics villain to complete the ballot paper, and it would appear that it’s the Joker: regular frivolous by-election candidate David Bishop is standing once again for his Bus-Pass Elvis Party and campaigning to turn a disused pub in the ward into a vegetarian casino called Viva Las Vegans. Perhaps this time the electorate will finally Love him Tender? Rutland council; caused by the resignation of Conservative councillor Tony Mathias who had served since 2015. For our other Midlands by-election of the week we move from one county town to another. 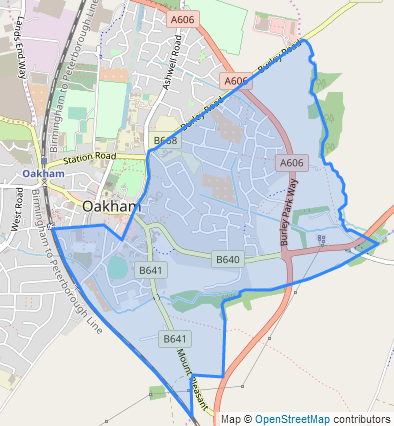 Rutland claims to be England’s smallest county (although this does rather depend on how you define “smallest” and “county”) and Oakham is its main service centre. The South East ward includes the council offices and the County Museum, and has seen some population growth in recent years with the building of new twenty-first century housing estates. 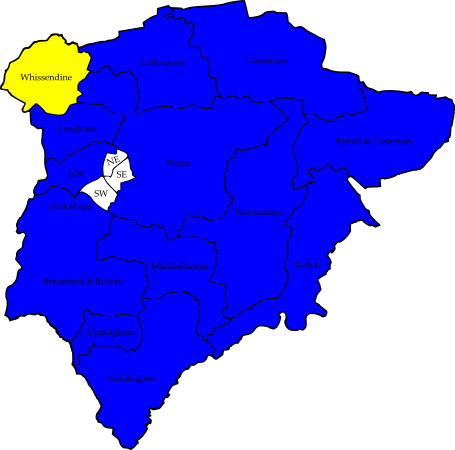 Rutland is not the most politically exciting of counties: the first election to this ward on its present boundaries, in 2003, was uncontested. The Conservatives won that one, and easily held a by-election two days before Christmas 2004 against Lib Dem opposition. Things got interesting here in 2015 when an independent slate took one of the ward’s two seats: shares of the vote were 39% each for the independent slate and the Conservatives and 22% for the Liberal Democrats. This by-election is a straight fight with the Lib Dems withdrawing. Defending for the Conservatives is Christopher Clark, who runs a training company and is involved with the Federation of Small Businesses: he sits on a group working on the growth of local market towns and (for the moment) on an EU grant panel. Challenging Clark is independent councillor Adam Lowe, an Oakham town councillor and twice Mayor of Oakham. Harlow council, Essex; caused by the resignation of the Leader of the Council, Labour councillor Jon Clempner, who had served since 2012. Clempner has also quit the Labour Party; in his resignation statement he blamed a campaign against him of harassment and bullying by the Momentum faction of the party. For the second half of this week’s column we are in the Home Counties. We start in Harlow, one of the many New Towns developed to the north of London in the 1950s and 1960s. The Little Parndon and Hare Street developments are from those decades, and still have a large amount of social housing betraying their New Town origin. 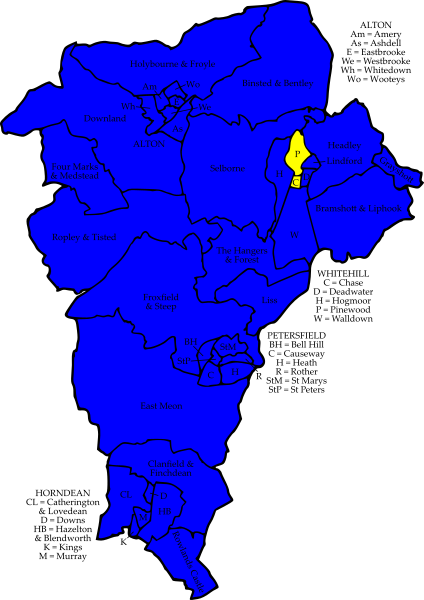 This is Harlow’s north-western ward, located immediately to the north and west of the central business district; within the ward are the Princess Alexandra Hospital, the local football and greyhound stadiums and the Pinnacles industrial area. 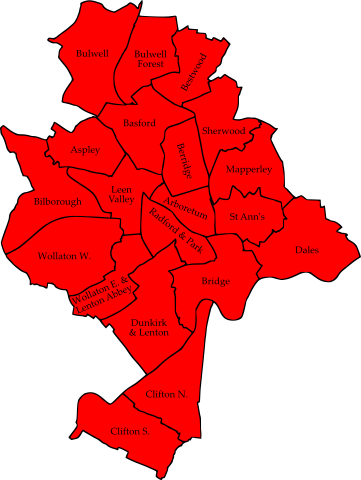 Harlow may have had a Conservative MP since 2010, but the constituency includes a small rural area outside the town and Harlow town itself is more Labour-inclined. Labour control the council with 18 out of 33 seats (plus this vacancy) and some of that majority comes from Little Parndon and Hare Street. This is a safe Labour ward, lost only at the low point of the Brown government in 2008 when the Conservatives won it. Clempner regained the Tory seat in 2012; in 2016 he was re-elected for a second term, beating the Conservatives 54-28. 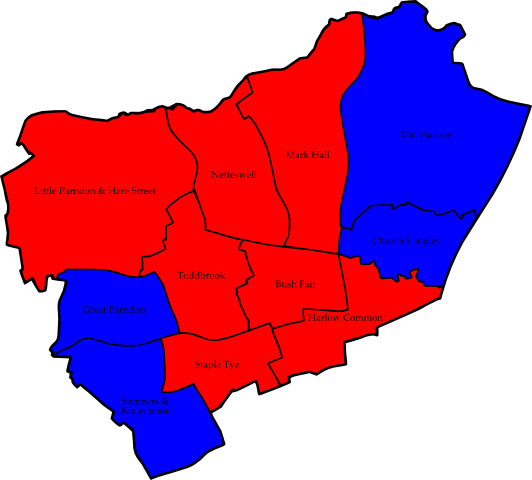 However, the Conservatives gained the local Harlow West county division in May so the Labour machine does have work to do – and losing your council leader over a factional dispute won’t help the Labour defence. That defence is led by Chris Vince, who has experience of big campaigns: he was the Labour candidate for Essex Police and Crime Commissioner in 2016, topping the poll in Harlow borough, and fought Chelmsford in the last two general elections. The Conservative candidate is John Steer, who fought Toddbrook ward at the most recent borough election in 2016. Completing the ballot paper is Patsy Long for UKIP. Dacorum council, Hertfordshire; caused by the death of Conservative councillor Alan Fantham at the age of 82. He had served on Dacorum council since 2003, and was chairman of Northchurch parish council for more than thirty years. Away from the councils he was described as a cricket legend, having scored 27,000 runs and taken 3,500 wickets for Northchurch cricket club and serving as club secretary for over forty years. For the only by-election of the week in a ward which could be described as rural, we travel to western Hertfordshire. Northchurch is an old settlement – a Roman villa from the first century has been excavated here – in the valley of the River Bulbourne. The Bulbourne isn’t much more than a stream but its valley forms a major artery through the Chiltern Hills, and the Roman Akeman Street, the Grand Union Canal and the West Coast Main Line all traverse the ward. As can be seen, this is an area where many pass through but few visit. 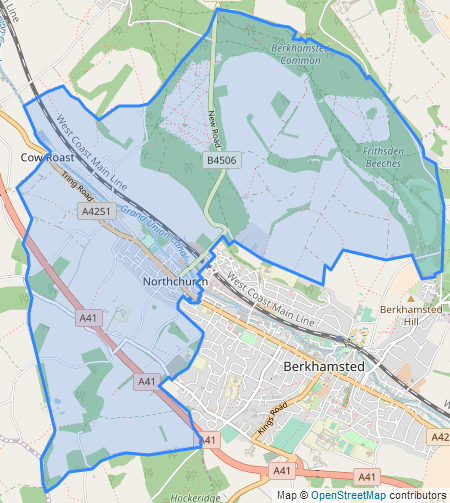 Now effectively a suburb of Berkhamsted, the ward is close enough to London to have a commuter demographic. 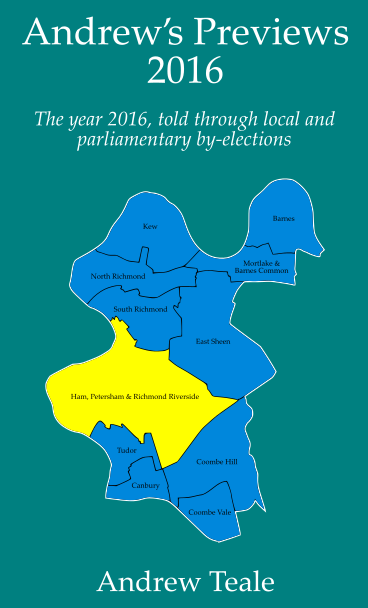 Northchurch ward has unchanged boundaries since 1979, and in all of the ten previous elections the Conservatives have won with the Lib Dems or their predecessors in a distant second place. At the most recent poll in 2015 the Conservative lead was 60-19. The local county division (confusingly named Bridgewater) is also safe Tory. Defending for the Conservatives is Rob McCarthy, an Aldbury parish councillor representing Tring Station ward. The Lib Dems have selected Lara Pringle, a barrister with 25 years’ experience. Completing the ballot paper are Gareth Hawden for Labour and Joe Pitts for the Green Party. Medway council, Kent; caused by the resignation of Conservative councillor Kelly Tolhurst. The MP for Rochester and Strood since 2015, Tolhurst is taking up a junior position in the Government Whips office. Your columnist likes Rochester. For many years the UK quiz circuit had a regular event at the Vines United Reformed Church in this ward, which gave me an excuse to come back year after year. (The fact that the event was always in July with hot weather helped!) Rochester always rewards a visit: the well-preserved High Street, ruined castle and magnificent cathedral reek of history, while the Baggins bookshop – which claims to be England’s largest second-hand bookshop – will often reward a browse. All these and more are within the Rochester West ward, which stretches from the town* centre south-west along the banks of the Medway. 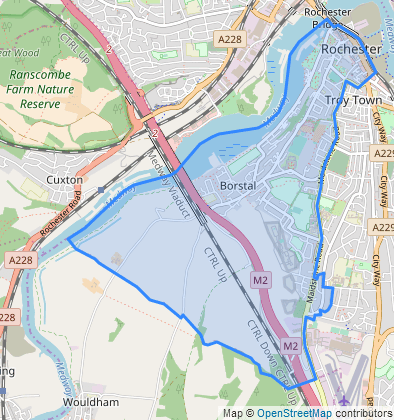 Within the ward boundaries are the village of Borstal – still home to a prison which gave its name to a former type of youth detention centre – and the impressive feats of engineering which are the Medway Bridges, taking the M2 motorway and the High Speed 1 railway line over the river. During testing of High Speed 1 in June 2003 a Eurostar train set a new UK rail speed record by crossing the Medway Bridge at 208 miles per hour, while in the same year the new M2 bridge won an award from the Concrete Society. The prison shows up in the ward’s census return, in which Rochester West makes the top 60 wards in England and Wales for the “inactive: other” economic category. Prisoners, of course, are not eligible to vote. This is a safe Conservative ward. Kelly Tolhurst was first elected in 2011, taking over a seat vacated by Mark Reckless who had gained the parliamentary seat the previous year. Three years later Tolhurst found herself standing against Reckless in the Rochester and Strood parliamentary by-election; she lost that round, but got the better of the UKIP defector in the 2015 general election a few months afterwards. On the same day Tolhurst was re-elected to Medway council at the top of the Tory slate in Rochester West; shares of the vote were 43% for the Conservatives, 21% for Labour and 20% for UKIP. Defending for the Conservatives is Alan Kew, a civil engineer who lives in Borstal village. The Labour candidate is Alex Paterson, who has recently joined the party’s staff after a fifteen-year career at the Daily Mirror. The UKIP candidate – in one of only two constituencies the party has ever won at Parliamentary level – is Rob McCulloch Martin. Completing the ballot paper are Sonia Hyner for the Green Party and Martin Rose for the Lib Dems. East Hampshire council; caused by the resignation of Conservative councillor Thomas Spencer who had served since 2015. We finish our progress from north to south in Hampshire within the South Downs National Park. The largest town within the National Park is possibly Petersfield, a coaching town on the London-Portsmouth road which now functions as a rural market town and tourist centre, with some commuting along the A3 to Portsmouth and London. 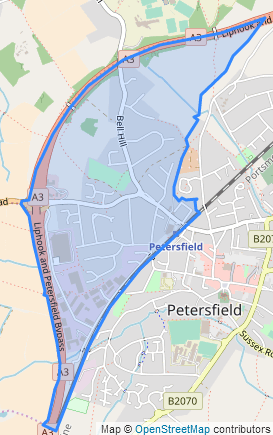 Judging from the census return a lot of those commuters will live in Bell Hill ward, which is the western end of town between the railway station and the A3 bypass. The largest local employer is probably East Hampshire council, whose offices are within the ward. This is a consistently Conservative ward and the main interest in its results is usually in who comes second. In 2015 that was Labour: shares of the vote were 47% for the Tories, 15% for Labour and 14% for the Lib Dems. UKIP got within 80 votes of the Conservatives at a by-election here in mid-March 2014, but the turnout for that poll was so poor that the Conservative majority was safer than it sounds. The winner of that by-election, Peter Marshall, didn’t seek re-election the following year, so this is clearly a ward with a high councillor attrition rate. Hopefully we’ll do better this time on the turnout front, although the fact that the ward’s usual polling station is unavailable might not help in that regard. Voters are asked to attend the council offices instead. Defending for the Conservatives is Clive Shore, who is hoping to become the ward’s fourth councillor in as many years: he is a former Petersfield town councillor and runs a consulting company. The Labour candidate is Steve Elder. David Podger is the Liberal Democrat candidate. 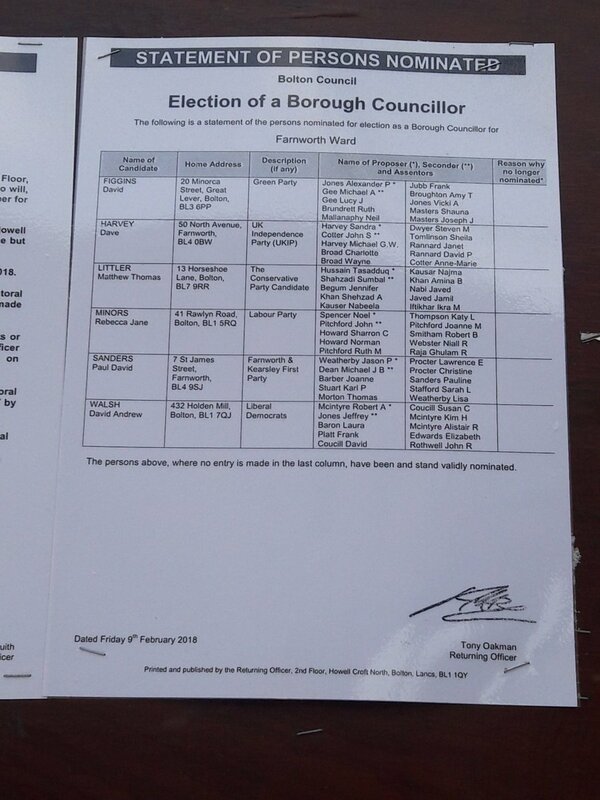 Completing the ballot paper are Jim Makin for UKIP (who gives an address diagonally opposite that of the Labour candidate) and independent Jamie Matthews.